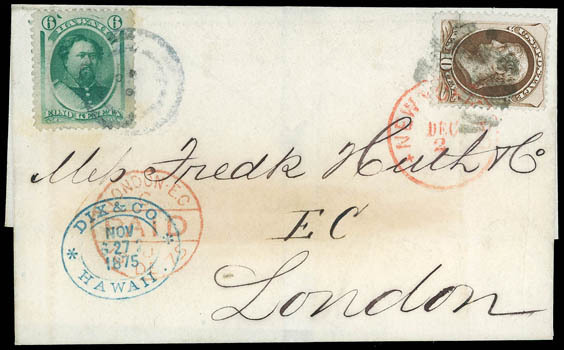 * Dix & Co. * Hawaii, Nov 27, 1875, blue double oval company handstamp on folded cover to London, England bearing Hawaii 6¢ yellow green (33), tied by patent cancel and United States 10¢ brown (161) tied by cork cancel and red "New York P.O., Dec 2" exchange cds, red London (12.13) arrival cds; light cover tone spot and 10¢ creased, Very Fine and colorful, ex-Pietsch; with clear 1996 P.F. certificate. Peters-Uota No. DIX-HS-1 Estimate $2,000 - 3,000. A RARE AND DESIRABLE HAWAII-UNITED STATES MIXED COUNTRY FRANKING TO ENGLAND WITH THE ONLY RECORDED EXAMPLE OF THE DIX & CO. PRIVATE HANDSTAMP. A link back to Sale 65 - Lot 323, along with its description, will be appended to your message.